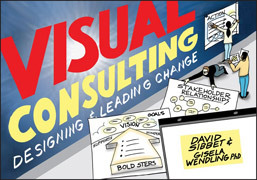 DAVID SIBBET is a world leader in visual facilitation and process leadership. He is the founder and CEO of The Grove Consultants International and is known globally for creating leading-edge process consulting tools for visualization, team performance, strategic visioning, and organizational transformation. GISELA WENDLING, PhD., is vice president of Global Learning at The Grove and codirector of the Global Learning & Exchange Network (GLEN). Her extensive experience in OD, dialogic practice, and learning from indigenous peoples about change is supporting new understanding about the potential of visual consulting.